I really am looking forward to this challenge. I love reading cozies so it's right up my alley. I can easily become a super sleuth in 2013. I'm also going for the second level this year! I just looked at my link and I put the wrong year after cozies. It should have been cozies-2013 and I have cozies 2012 so it does not go to my blog. I finished more than 12 this year so I am going for level 3. I love the super sleuth, I am a speed reader and read about 10 books a month!. Count me in. I want to be a super sleuth. I added a shelf for on GoodReads for the challege. I am a little confused. 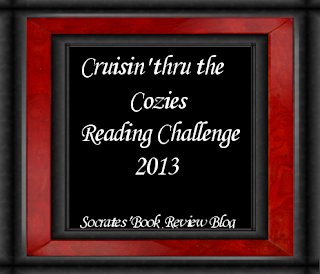 Do I just post my cozies on my Cozy Challenge Shelf in GoodReads? You can post it in either Goodreads or here or both. Totally up to you. Super Sleuth! I've already read over 50 this year. Love this challenge and so glad it's back!!!! I didn't do so well with my 2012 challenge, but I'm going to give it another go for 2013! Thanks for hosting again, Yvonne! Great challenge. I completed your challenge in 2012 and am looking forward to doing it again for 2013. I'm going to try the 'What an Animal' challenge next year - my first time on that one. I joined the Cozies Challenge again - love it. I also really, really love the 'Finishing the Series' challenge - please host it again. Level 3, Super Sleuth again in 2013. I'll take investigator for 200, Alex. I'm in! Can't wait to see what reads you guys come up with. so glad you are doing this, as I want to finish all of Mrs Pollifax. and I was so happy she was on your list of Cozy mysteries, so many of my readers have not heard about her! Have you tried the audios of that series? the narrator is awesome, perfect voice for Emily Pollifax. Great challenge, so happy I found your blog and found this challenge! I'm really looking forward to it. :) I'm hoping to reach the level of Super Sleuth! This such a great challenge :) I'm really looking forward to getting started! Just found this challenge. I read over 25 cozies in 2012 (maybe more - have to check the cozy list) and I noticed that someone read over 50 - we need a new category! I am signing up for the Super Sleuth Level. I have created a subfolder on Goodreads to keep track of my books. I am signing up for the Super Sleuth Level, 13 or more books! I'm shooting for Super Sluth as part of my 2013 Reading Challenge (50 Books again this year)! I'm giving this one a try this year! Back for another year. Looking forward to my first cozy read in January. Probably a Miss Marple. I'm going for Level 1 Snoop. This should be fun. Joining in this coming year for Level 2 the Investigator. Looking forward to reading some cozies...thanks for hosting! I'm really excited to join this challenge. I have a quick question first. I started a cozy mystery last month, which I'm about three chapters in, would it qualify for this challenge. I know the dates run from Jan-Dec 2013, but some challenges will accept a book started in 2013 if started in the previous year. Unfortunately, for this challenge, all books have to be read between Jan and Dec of 2013 so nothing that began prior would count. Sorry! I love this challenge - there are so many good cozies out there!!! Thanks for hosting. I'm in again. Super Sleuth here I come. Now to decide what books I will actually read this year. Gah, I put my link in the completed reviews by mistake. Sorry! That link is to my sign up post on my blog. Sorry didn't comment before, but I'm going for Super Sleuth and I'm new to Cozy Mysteries. There are 3 books listed in the ALPINE MYSTERIES post linked above but only 2 of them count for this challenge because I read the 1st one on December 31, 2012. I linked the 2 I read in January. This sounds fun. I already have signed up for Mystery challenge hosted by Amy - The Crafty Nerd, and this is going to be my second mystery challenge this year. I am up bfor Level 2, but wish to read more than that. So, I'm starting a reviews blog this year, and I want to have my reading challenges there instead of on my general blog. I've signed up again with my new blog (Carstairs Considers). I will still update my post at my original blog (Random Ramblings from Sunny Southern CA), but if you want to delete that link, that's fine, too. Sorry for the confusion/added work. No problem. I can leave both blogs up since you are updating both of them. I am posting my list and reviews on Goodreads group for this challenge. Great idea for a challenge! I've just signed up, published my challenge post, and I'm adding the cozy reveiws I've done so far this year. I'm challenging myself to reach the Super Sleuth level. Thank you for sponsoring/hosting this challenge! I've really been enjoying this challenge! I'm at 10 so far; my goal is 13. (Actually, one post covered three books, so I suppose technically, I'm at 12 books but only 10 posts.) Thank you so much for hosting this challenge, Yvonne! Hurray, I made it! I've read and reviewed 13 cozy mysteries so far this year. (And I've got several more in the pipeline.) I had a lot of fun doing this, and found a few new blogs to follow, too. Thank you for hosting, and I've already signed up for next year! OK, I edited my post to include the books I read for this challenge. I have my list on Goodreads and have linked to my blog, also. Just linked up my wrap-up post, which includes all the books and the links to the reviews. Thanks for the great ride! thanks, that was fun, I read 12 books, which allowed me to almost finish my dear Mrs Pollifax series - 3 more to go. I have a slew of them to review, I guess I'll do a common post for many of them. I will finish also A Caribbean Mystery by Agatha Christie this week-end. I won't join the challenge next year, trying to cut down on these, but will at least read 3 by Gilman and start Peabody!